I bet you’re like me and have a lot of partial skeins of yarn hiding in your stash. I’ve been given a lot of partial skeins, too. Some of these I’m able to pass along to a couple of friends who crochet more than I do, who make things for their grandchildren and for charity. But, there are some scraps I keep, thinking that one day I’ll find just the right project for them. So, the search is on. I’ve found several that I really like. I think my new favorite scrap afghan is the LB Alchemy Afghan. It makes a beautiful stitch pattern that lends itself to a variety of yarn weights and any color. (Too bad there’s no detail picture of the stitch. Try out a few rows to see the full effect of the stitch pattern. It would be especially attractive in a colorway for autumn as it reminds me of falling leaves. 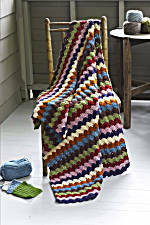 Another obvious example of a good way to use up scraps and partial skeins is granny squares. Oops! I hate joining squares, so maybe not. Also, be aware that a baby or toddler cap will not use a whole skein. I can make up a beanie or similar cap in about an hour. Scraps work well for these too. Same for those fingerless mitts. If you have a bag of scraps or partial skeins, measure them out and use half of each color for one mitt, reserving the other half for the second mitt. If there’s still some yarn left over, make a cap! Barbie clothes and other tiny items like amigurumi and potholders will make good use of your scraps as will headbands, triangle head scarves, and strip-ey winter scarves. Make them as long as you like. You’ll like the color balance better if you don’t use up all of one color in one spot. Use some, then add the rest in later. The resulting color bands are more pleasing to the eye. And, now, the rest is up to my readers. Check the post for Monday, April 12, 2010 to post a link to your favorite scrap project and enter my April giveaway. I’VE BLOGGED ABOUT THIS WONDERFUL BLOG BEFORE. EVA (MADEMOISELLECHAOS) is a crocheter extraordinaire! Check out her blog for a lot of nifty crochet, free patterns, and oodles of inspiration! If you make a baby hat make one for their doll or favorite stuffed animal and they will try to keep theirs and their litttle friends on their head rather than pull them off. I like to use my scraps for many things such as cat toys, coffee cup cozies, crochet flowers later to be used for appliques. I love this pattern for using up scraps.